← Does The End Ever Justify The Means When The Means Is Always A Lie? Multi Culturalism Is Not A Quebec Value! Finally we see who the people are and which political parties are taking part in denying the English-speaking people in the Province of Quebec their religious rights and freedoms guaranteed them under the Charter Of Rights And Freedoms of Canada and why they are doing it. The politicians in the Parti Quebec’s have finally come out and admitted that they are just a bunch of paranoid bigots afraid that no one will want to be French if they are not forced to be. I feel sorry for them to live in constant fear of being made extinct as a society, because as a people you feel that unless forced no one wants to be like you. I always thought that there was more behind their argument, their reason for being than just raw fear and open bigotry, but I guess I was wrong. The time since Rene Levesque has for sure seen a change in the direction the Parti Québécois wants Quebec to be seen as and it is too bad. They used to boast that they were the party that stood up for the immigrants and they wished only to see their culture secured, but that was in the past. Now they are being run by some frustrated angry old women who have given their lives, youth and vitality to the cause of separation an effort that has failed and they are very angry and feeling very betrayed. These angry females are seeing red and their claws are out. How dare the revolution be over, how dare the rest of Canada ignore them; how dare the people of Quebec lose interest in the struggle. Well it will not happen on their watch. In fact they know that after them there is no one dedicated enough to their fight, willing to destroy the province and all that is good and decent in it to achieve separation from Canada, so they have turned upon the heat hoping for a spark from anybody that will ignite the fire that has gone out of the separation movement. 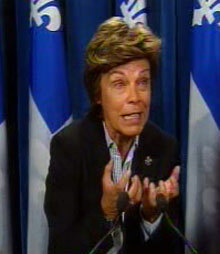 The situation in the Parti Québécois leadership reminds me of an old saying, “Hell hath no furry like a woman scorned”. If this means these ladies must treat the English in Quebec like a cheating spouse then so be it, seems to be their reasoning. These ladies want a divorce and they want it now. They also want the house, all the family assets, the children and the pet. They would prefer if you just left quietly, but they are prepared to fight if the have to, and make you life a living hell u less you concede. The only problem with their theory is that when they alienated the immigrants who used to vote for them they began to eat away at a crucial voting block for them. A voting block that could have seen them attain their ultimate goal of becoming a country. 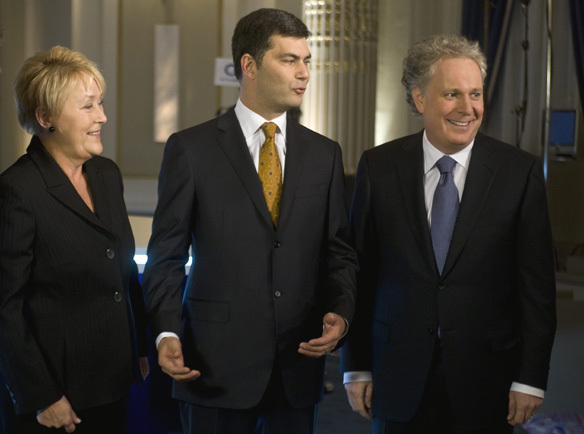 The Parti Québécois made one big tactical error they forgot who was responsible for putting them in power in their glory days. The only thing these ladies of power can do now is act out their frustrations and anger on what they think are the people responsible for their wasted lives and that would be us the English of Quebec. I will give them one thing they are brutally honest. they stood up said their fight has nothing to do with security it has to do with the desire to have only one culture, one spoken language in Quebec and that is French. Bravo finally an honest group of politicians. This honesty in no way makes it right, or the goal any less prejudice, or self-serving, but it is honest. I do not think that this honesty will get them elected, or see them attain the goal of separation, but at least the voter will know what a vote for them means. The cat is out of the proverbial bag a vote for Louise Beaudoin and her party means a vote for nothing but French culture for Quebec whether religious, historical, language etc, all we are entitled to is French. When will we have to bleach our skin, or move into certain areas for English, Muslim, Jew, or anything that is not French? When will it be a crime to speak anything but french in Quebec, under threat of being fined, jailed or, worse? This is the political party that said trust us there is a place for everyone in Quebec, we are not like the Nazis; we respect the rights of all; not a hard claim to honor when the other people in your land have no rights legally under the law where you govern. Hold on to your mamma’s, your turbans and even your crosses Ms. Beaudoin and her Parti Québécois want them banned too although I do not think she will really go there. I just wonder how long the English politician will allow the Parti Québécois to govern Quebec from an opposition seat in the Quebec national Assembly, because they are afraid of what will happen to them if they object, or deny something. It would seem that winning an election is more important than actually governing the province or country. I am shocked that the governing Liberal party of Quebec led by Jean Charest, has decided to jump on the Parti Québécois band wagon of hate and fear mongering, by not only voting for a law that is clearly separatist in nature and prejudice in practice and not in accordance with the laws of the country, but they have allowed the tone and the spirit of the of the language, culture and purity of race debate to slip to the pre gas chamber level of Nazi Germany. 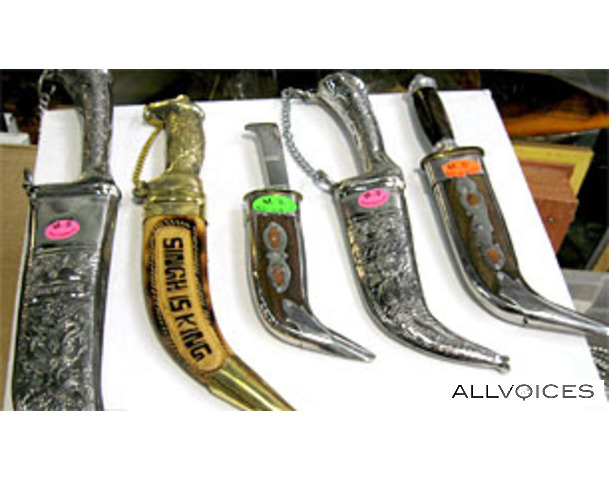 It is not just the kirpan, or the hijab, or the niqab issue, it is the language the open blatant denial and absolute refusal to acknowledge anything that is not French by nature. 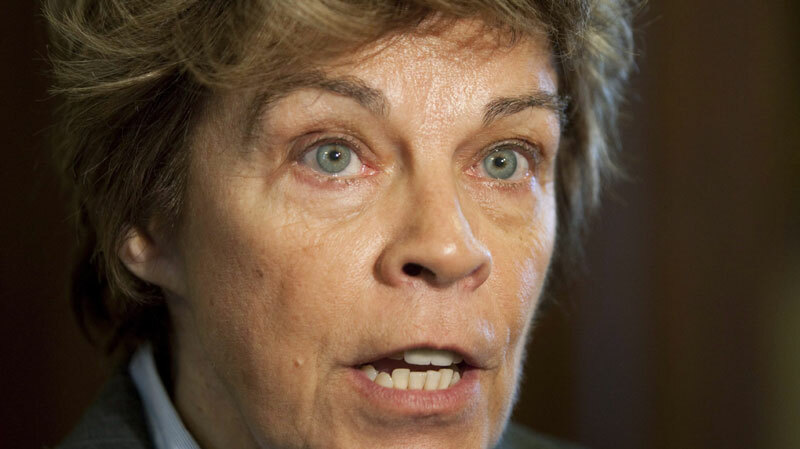 In Quebec City yesterday, Louise Beaudoin stated that while multiculturalism may be the official policy in Ottawa, it has never been a Quebec value. Beaudoin also said that German Chancellor Angela Merkel and British Prime Minister David Cameron have also openly questioned the wisdom of multiculturalism. What is it going to take to get the federal government to see the problem in Quebec for what it is? The province of Quebec is practicing a form of non violent genocide right now and the country and the world are just sitting back protecting their political butts as it happens all over again, only this time it isn’t happening to the Jews of Europe, it is happening to the English of Quebec. What does Steven Harper, Mr. security need to see before he acts, smoke from burning bodies coming out of smoke stacks? We have been sold out by Harper and his crew because he would like to have a majority and feels as long as he does not rock the boat and anger the in the middle francophone voter he will keep the 10 or so seats he has now in Quebec. Another example of how much power a provincial opposition party, the Parti Québécois wields in Ottawa, because the current federal government would rather win an election than actually govern Canada. 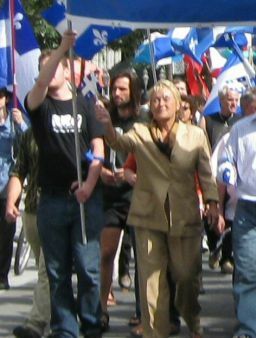 Head of the Parti Québécois marching in solidarity with known terrorist organization. I think that it is high time that the Prime Minister, Vic Toews and Jason Kenny get off of their butts and started doing something about the terrorist threat going on right under their noses in Quebec. Let us see, we have a group of Canadian politicians talking and practicing what would be treason in any other country in the world and I am not so sure that it is not pushing the boundaries of our confederation. 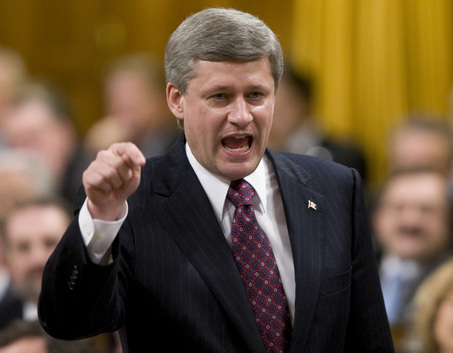 They have placed the law of the province above the law of the land and harper give lectures to Mubarak; what a joke. When will the federal government protect us English in Quebec like they protect Israel and her right to exist in peace and harmony with its neighbors, or is the dream only turned into a reality for others and not for the English Quebecer. Maybe it is time for us English to meet in a public square and protest, maybe even die and then maybe the Government on all levels will see that we are being oppressed right here under their noses and if they’re looking for a cause to champion maybe they could start here in Quebec where we are being wiped out. Vic Toews you coward where are you now, or is it truly only certain people you see as a threat to Canadian security and unity as a country, or is there really such thing. You are so intent on stopping the threat from beyond our borders that you can not see the threat from within it. You have talked a good game, about Canadian sovereignty and the need to keep Canada whole, but did all that mean is that we were safe as a country as long as you stopped a few boatloads of Asian Muslims from getting into the country illegally. When Quebec goes totally nuts and start exterminating all that is not French will you this situation as a threat then? Which province will be next and what is left for Canada and the unity we once enjoyed? I never thought that I would hear those terrible words spoken from a Canadian politician, or political party, nor that it would be allowed and condoned by the majority of the Quebec Legislature. I never thought that the federal government would defend the rights of other people in other countries, but would choose not only to ignore the plight of its own, but would actually come out and encourage such language and bigotry, not only in word, but agree with Quebec’s corrupt, unjust laws in principle. If you think that I have exaggerated the case in Quebec, pack up your family and move down here and become extinct like us. Vic Toews in my opinion is the type of political bigot that uses his office to target what is easy for the rest of Canadians to be afraid of and amplifies our fear of the unknown, the prejudices we all harbor deep inside and even the hatred we already have, because it is easy, but stays well clear of what he and his political party know to be a real threat to Canada, because it will not be an easy fight. Why don’t we move, why should we have to? Where is the law, or what is wrong with it, that nothing can be done and a rogue province can not be stopped, or brought back into step with the rest of the country. Why have we the English of Quebec been sacrificed? Will the government of Quebec only back off if the English do what is being done in Egypt? Will the federal government of Canada only act if things get ugly enough to bring out the army; it has happened before in Quebec, when one side thought they had no choice and that it was the only way they were going to be taken seriously? Maybe the oppressor will be brought down a peg, or two in the next election with the combined voting block of all the English and the immigrants that have been alienated by the Parti Québécois. Maybe we will put the separatist back in the cess pool that they crawled out of. Oh my did I just talk treason against the country of Quebec? I guess it is time for the worm to turn and it will; we grow tired of this crap and if the federal government will not stand up for us and protect us, maybe we need to protect and stand up for ourselves, whatever form of protest it takes. Calling in the army and putting Quebec under martial law was not an easy, or popular decision, but when they said he could not do it and survive politically, he said, "Just watch me". I have heard people make the claim that Pierre Elliot Trudeau really did nothing while he was in office and take pot shots at his accomplishments, but at least this politician stood up for Canada, was not afraid to fight for its unity and kept the Americans in their place. I liked the way he fought the separatist no matter where he found them, whether they were in the east, or west. He was not loved, or even liked by everyone at all times, but no leader, or ordinary person ever is, but his love for Canada and his desire to see this country remain whole, multi cultural and a good place to live for all Canadians can not be denied. Trudeau called the country the great mosaic and saw no threat in our cultural diversity, but saw only the beauty in it and to me this made him a great man and fearless leader. I think he was the last leader Canada had that put their country ahead of their political aspirations. 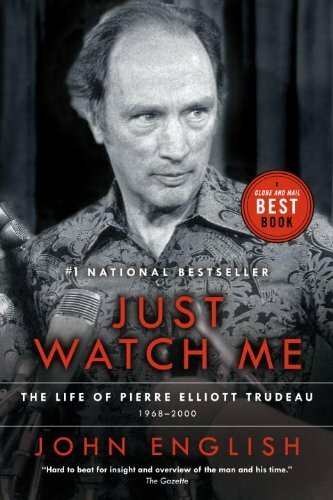 Pierre Elliot Trudeau may have had his faults, but I think Canada needs another leader of his confidence with the courage to fight for Canada and fight the good fight whether it costs them an election, or not. This entry was posted in abuse, abuse of power, Beat Cops, Beat Cops, Canada, domestic violence, Government, Montreal Police, Prejudice, Quebec Sponsored Genocide, Quebec's Abuse of Its None Quebecoise Residents (Other Canadians), Schools and Learning Places, stereotyping, Teachers, Terrorism, Uncategorized and tagged abuse, Angela Merkel, bigotry, Canada, Canadian Charter of Rights and Freedoms, christianity, courts, Crime, Culture of France, David Cameron, English Canada, Government of Canada, heavy handed tactics, Jean Charest, judges, Juvenile Delinquency, Kathleen Weil, Louise Beaudoin, Montreal, Multiculturalism, Parti Québécois, Pierre Trudeau, politics, Prime Minister of the United Kingdom, prodedure, Quebec, Sikh, Stephen Harper, stepping up to the plate, The Catholic Church, Vic Toews, Warfare and Conflict, World Sikh Organization. Bookmark the permalink.